Randolph County is a county located in the U.S. state of West Virginia. As of 2000, the population was 28,262. Its county seat is Elkins6. According to the U.S. Census Bureau, the county has a total area of 2,693 km² (1,040 sq mi). 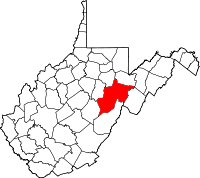 Randolph is the largest county in the state of West Virginia. As of the census² of 2000, there were 28,262 people, 11,072 households, and 7,661 families residing in the county. The population density was 10/km² (27/sq mi). There were 13,478 housing units at an average density of 5/km² (13/sq mi). The racial makeup of the county was 97.69% White, 1.07% Black or African American, 0.16% Native American, 0.38% Asian, 0.01% Pacific Islander, 0.16% from other races, and 0.53% from two or more races. 0.68% of the population were Hispanic or Latino of any race. This page uses content from the English language Wikipedia. The original content was at Randolph County, West Virginia. The list of authors can be seen in the page history. As with this Familypedia wiki, the content of Wikipedia is available under the Creative Commons License.